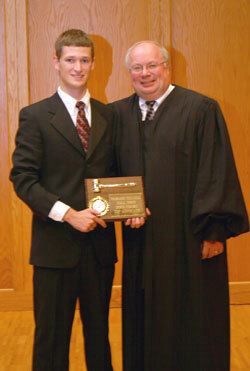 A sophomore again won top honors at Wabash College’s Moot Court competition Tuesday night in Salter Hall. Jackson Price, a Louisville, Ky. sophomore, was named top advocate. He teamed with last year’s winner Steven Rhodes ’07 to argue the respondent’s position. Kyle Cassidy ’08 and Aaron Cook ’06 spoke as petitioners. The case was based on law schools trying to ban military recruiters from recruiting on campus because of the military’s rules on sexual orientation. The four Wabash men took turns arguing and being peppered with questions from a panel of real judges. The Honorable James S. Kirsch, Chief Judge of the Indiana Court of Appeals, chaired the panel. His son Adam ’07 is a Wabash student. Kirsch was joined by Hon. Terry Crone, also a member of the Court of Appeals. Hon. Douglas Morton ’68 was the third judge. Each year a Wabash professor rounds out the panel. Prof. Kay Widdows sat in judgment this year. "This is the first time I’ve been at this event, but I’ve heard about it from some of my fellow judges who said ‘Doug, you really need to do this.’ " Morton said. "I’m very impressed with the quality of the arguments I heard. The work these young men put into this and their ability to stand up under difficult conditions, the questions we throw at them, and how they handle themselves it shows that they’re fine young men." The judges didn’t hesitate to pepper all four advocates with questions moments into their prepared remarks. They would question their logic, the law and challenge their arguments throughout. "It was a little nerve wracking coming in and being in front of real judges," Price said. "I hold lawyers and people in the legal profession in pretty high esteem so it’s a little intimidating being with these people I hope to aspire to join one day." 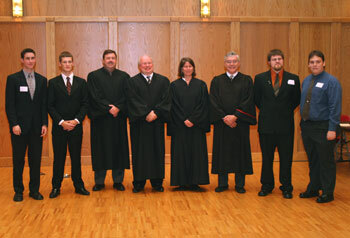 Wabash’s Moot Court is in its 12th year. The program is sponsored by the Wabash College Rhetoric Department and the Indianapolis Association of Wabash Men. Scott Himsel ’85, a Wabash Visiting Assistant Professor of Political Science, is just one of many organizers. Through the years, Himsel estimated, as many as 80-90 Wabash-graduated lawyers have participated in the preparation and preliminary rounds of Moot Court. "I think they do it because its fun," Himsel said. "It’s fun to come back to the campus which holds a lot of great memories for them, but it’s also fun to contribute in a way other than just writing a check. It is great to actually help with the students' education. What’s really rewarding about it is how well they do." The alumni involvement is also a factor that draws many students to participate. "Having alumni support is one of the most important things I think in developing young aspiring professionals," Price said. "Everybody I met in the program, and every alumnus I encountered, has been great – they’ve only wanted to help us out. It’s very encouraging and beneficial for the students." But the competition is tough. The judges have to look at the arguments differently than they do each day in the courtroom. "Here we are testing them and not the legal positions, that’s different because in the real courtroom the search is for the law and the truth," Morton said "Here we have to measure their ability to deal with difficult issues." And it takes a lot of work to prepare for the tough questioning. "I put it off far longer than I should have," Price said of his preparation. "Friday, I definitely crammed a whole lot. After each round I’d go back and I’d read the case again and again and come up with new arguments and find new points. It was a substantial amount of time." But the sophomore was thrilled with the result and the experience. "It was great. I’ve always wanted to be a lawyer so this was a lot of fun. I love public speaking. I love being in front of people and arguing so I felt pretty much at home." At top right: From left, Steven Rhodes, Jackson Price, Hon. Terry Crone, Hon. James Kirsch, Prof. Kay Widdows, Hon. Douglas Morton, Kyle Cassidy, Aaron Cook. Lower left: Judge Kirsch presents Top Advocate plaque to Price. On homepage: Scott Himsel chats with Rhodes and Price while awaiting the judges' decision.